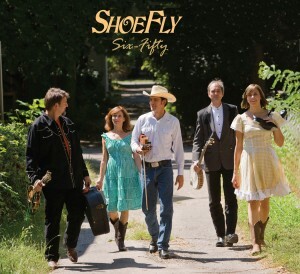 Rooted in the traditions of early country music, bluegrass and honky-tonk, ShoeFly was a lean & mean offshoot of Rhythm in Shoes. An ensemble of dancers and musicians, a two-generation family band adding youth to experience, ShoeFly filled the stage with high energy sight and sound, bringing a party wherever they went. The senior half of ShoeFly got their starts in the 1970s and have been active in the national music scene ever since. Rick Good was a founding member of the notorious Hotmud Family, a co-director and performer with Rhythm in Shoes for twenty-three years and a 2010, Ohio Heritage Fellow. He is recognized and respected for his accomplished banjo playing, heartfelt singing and crafty songwriting. 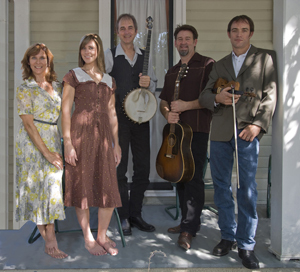 When not engaged in ShoeFly endeavors, Rick also picks with the Red Clay Ramblers. 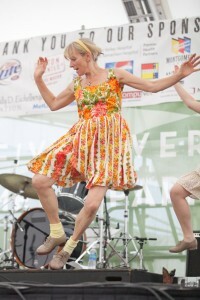 Sharon Leahy danced and toured with the Green Grass Cloggers for several years, worked as a dancer in New York City through the 1980s, then moved to Ohio to co-direct and perform with Rhythm in Shoes for twenty-three years. Sharon’s love and understanding of old time dance and music is clearly seen and heard through her award-winning choreography, artful singing and driving rhythm on guitar and bass. Paul Kovac is well known in the bluegrass and old time music scene for his expert guitar, banjo and mandolin playing, as well as his strong, soulful singing. 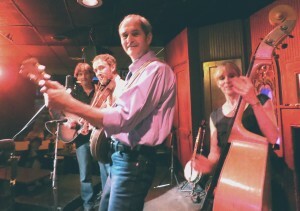 A member of several bands over the last thirty years, Paul has played with Clear Fork, Hillbilly IDOL, and Critton Hollow String Band while accompanying such greats along the way as Bill Monroe, Chet Atkins, Hank Thompson and Hazel Dickens. Ben Cooper. Adept on guitar and fiddle as well as standup bass, Ben is the oldest son of Sharon and started touring with Rhythm in Shoes in the fall of 1997. 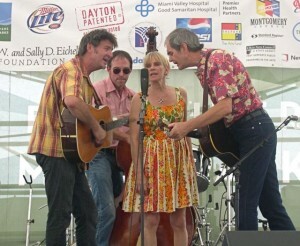 He has been performing ever since, also playing with the Ohio Corndaddys and The Buvas when and wherever he can. 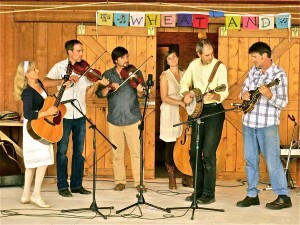 Emma Young has been part of the old time music community since before her first step. Her formal training began with Irish Step Dancing at the age of four. 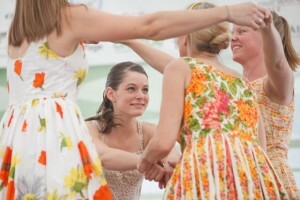 She soon moved on to tap and clogging, performing with her mom and dad, Sharon & Rick, in Rhythm in Shoes. An avid lover of old time music, Emma also plays clawhammer banjo and sings great harmony. Since moving to Southwest Louisiana, she has honed her skills as a studio backup vocalist and standup bassist. 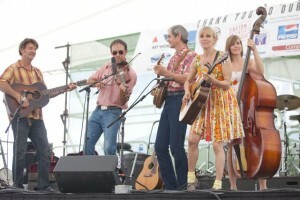 Local fans of ShoeFly saw the full ensemble at the Cityfolk Festival in downtown Dayton on Sunday, July 1st. Emma was up from Louisiana to make the band a quintet, while Beth Wright and Hazel Black came on board to spice up the dancing. The weather dominated this year’s festivities with extreme high temperatures discouraging attendance and high winds actually closing the festival down on Friday night and part of Sunday evening. ShoeFly started at the dance pavillion Sunday afternoon. We were pleasantly surprised that folks were there and ready to square dance in the near 100 degree heat. Sharon called the figures for a solid hour and a half and nobody passed out. Later that day, on the mainstage, we were just getting warmed-up and pulling in a nice crowd when severe weather warnings threatened a reprise of Friday’s storm. The good news is, the folks at Cityfolk are already talking about having us back next year to finish our set. ShoeFly spent the Memorial Day Holidays in Michigan where the Wheatland Music Organization held its annual Traditional Arts Weekend. Emma and her talented husband, Linzay Young came up from Louisiana to join the band for an onstage performance and several workshops. 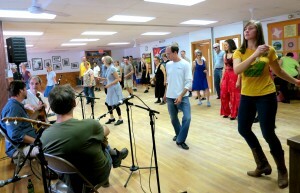 Versatility was the keyword throughout the weekend as the musicians and dancers of ShoeFly taught Swing Dancing, Tap, Clogging, Cajun Dance, Old Time Banjo, Bluegrass Banjo, String Bass, Harmony Singing, Body Rhythms and more. An added treat for band and campers alike was the ever-sparkling presence of Nate Cooper, taking time off from various circuses of the world to join ours. Every new CD needs an official release party. ShoeFly’s first offering, Six-Fifty, was perfectly suited to Dayton’s favorite music venue, the Canal Street Tavern. Folks caught the music live and up close the night of May 19th, then took it home with them to enjoy over and over again. ShoeFly went south to Hillbilly Days in Pikeville Kentucky. We had quite a time, to say the least. In fact, none of us are quite sure what to say. Let’s put it this way, part of our renumeration for the event was four pints of Popcorn Sutton’s last run, if you know what I mean… The band enjoyed some musical action in February. In addition to a couple very enjoyable gigs in Newark and Circleville, Ohio, the band traveled down to Memphis for the 2012 Folk Alliance Conference for some networking, gig-wrangling and several late night showcases… The Wednesday night old time acoustic jam at the Trolley Stop in Dayton featured a special appearance on December 21st by ShoeFly and Good ‘n’ Young. An enthusiastic tavern full of music lovers got their fill of great music and good beer, always a fine combination… Last summer, Sharon, Rick & Paul were on staff at Old-Time Music & Dance Week at the The Swannanoa Gathering at Warren Wilson College in, North Carolina… Last Labor Day weekend, the Wheatland Music Organization in Remus, Michigan held their annual Traditional Arts Weekend where the ShoeFly quartet (Rick, Sharon, Paul & Ben) performed and taught. Augmented by the presence of Paul’s talented wife, Laura, we covered everything from beginning to advanced clogging, harmony singing, stringed instrument playing and Boomwhackers… Earlier in the month, the quartet will took part in an evening of Old Time Music at the Canal Street Tavern in Dayton, Ohio. 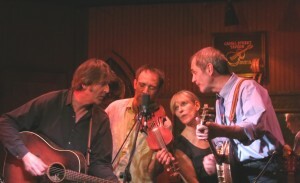 Also on the bill were Phil & Ann Case and The Corndrinkers… The following evening, the band moved to Circleville, Ohio and JR Hooks Cafe for an Americana Music Series concert… Almost too far back to remember now, our first big road trip took us to Merlefest in April, 2008 for a successful set of appearances at one of our country’s premeire festivals… Our hometown debut finally happened several weeks later in June at the Canal Street Tavern. That Australian show had been scheduled online casino for the previous winter but at the casino time the weatherman said snow and, lo and behold, he was right… The summer season also found us at the Delaware Valley Bluegrass Festival in July for a couple of well received sets… The Winter of ’09 found the ShoeFly trio at the Beachland Bar & Ballroom in Cleveland, opening for the Steep Canyon Rangers… Later, in the Spring, the whole ensemble performed in Illinois’ classic Sandwich Opera House… Last Summer, we battled the roar of the nearby helicopter ride at the Ohio State Fair and played a set of music right after Rick received his 2010 Ohio Heritage Fellowship Award.